As of November of 2010 North Atlantic Specialty Bag’s Reading Facility has gone solar, enabling us to create eco-friendly product packaging. 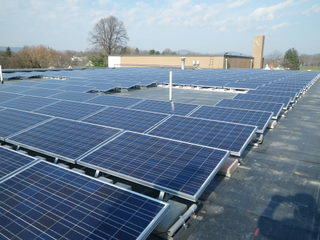 This new system has been designed and installed to produce enough electricity to run our whole Reading, Pa. facility. This in conjunction with opening our Midwest regional facility in Beloit Wi in 2009 has helped us significantly reduce our impact on the environment as a company. If you want to learn more about how this Reading system works click on the following link and you can actually see the production of energy in real time. There is also a section explaining how the system functions. As you know there has been much talk in our industry about biodegradable, renewable, compostable, etc. We at North Atlantic Specialty Bag are committed to our customers needs and are continuously looking for new technologies to fulfill those needs. Currently North Atlantic offers a line of Biodegradable and compostable paper bags that fit those needs in shorter shelf life application. The biggest hurdle we face in our industry to attain these objectives is shelf life verses environmentally friendly packaging products. Historically many of the products that are packaged by our higher barrier products need high levels of barrier properties against oxygen and moisture to extend shelf life for quality. The issue we as packaging suppliers face is that green products are normally on the opposite side of the spectrum to barrier. The environmentally safe barrier packaging industry is a very new market and because of that, we are starting to see some barrier products touting eco-friendly, compostable and biodegradable labels that are at best suspect. Make sure when discussing these qualities with any supplier that they can provide you with the proper certification showing the testing that has been done on their products to confirm their claims. Our experience in this product sector right now is that there are a lot of people talking about it but no one that has actually produced a product to provide the levels of barrier our industry is accustom to receiving. What we have seen is packaging with significantly lower barrier at price premiums of 30-40% or higher. I know as a company it’s tempting to jump on this marketing bandwagon but we are being very careful to make sure what we bring you is a legitimate value. We promise to continue to investigate this industry and keep you informed on what is available and when. In review of where we have come from, the flexible packaging industry which we are a part of has come a long way in protecting the environment primarily in source reduction. For instance, it would take a full tractor trailer of coffee cans to package the same amount of coffee as 1 pallet of coffee bags. At North Atlantic, we are taking this even farther by offering you the Economy Line. The Economy line offers excellent barrier for coffee roasters that have product turnover of fewer than 8 weeks while reducing your material waste stream by 30%. Our determination of 8 weeks shelf life is based on independent testing showing oxygen levels less than 5% for over 8 weeks on this product. An added bonus is that if the shelf life is acceptable there is a cost savings as well. North Atlantic has also looked at the environmental savings of less freight. With that in mind, we have opened an additional facility in Beloit Wisconsin bringing us closer to our customers in the Mid West. This move allows us to service those customers faster and save significant fuel in delivery. I am also very proud to announce that by September of 2010 our Reading, Pennsylvania facility will be producing 100% of its own power needs with a new solar array being installed in August of 2010. As I have said we will continue to investigate ways of helping the environment and as these technologies become available we will make it a point to bring them to market.